Varntresk Church (Norwegian: Varntresk kirke) is a parish church of the Church of Norway in Hattfjelldal Municipality in Nordland county, Norway. 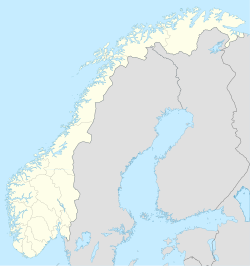 It is located in the village of Varntresk. It is one of the churches for the Hattfjelldal parish which is part of the Indre Helgeland prosti (deanery) in the Diocese of Sør-Hålogaland. The brown, wooden church was built in a long church style in 1986 by the architect Pål Guthorm Kavli. The church seats about 70 people. The church was consecrated on 31 August 1986. ^ "Varntresk kirke". Kirkesøk: Kirkebyggdatabasen. Retrieved 2018-09-29. ^ "Oversikt over Nåværende Kirker" (in Norwegian). KirkeKonsulenten.no. Retrieved 2018-09-29. ^ "Varntresk kirke" (in Norwegian). Retrieved 2011-11-17. ^ "Varntresk kirke" (in Norwegian). Hattfjelldal kirkelige fellesråd. Retrieved 2018-09-29.